Bank holiday meant no track so I decided to get a steady paced 5 miles done in the morning before work. I have no idea of the speed but I was trying to work at 80% or so effort throughout. I felt like this was a good run so therefore it was. 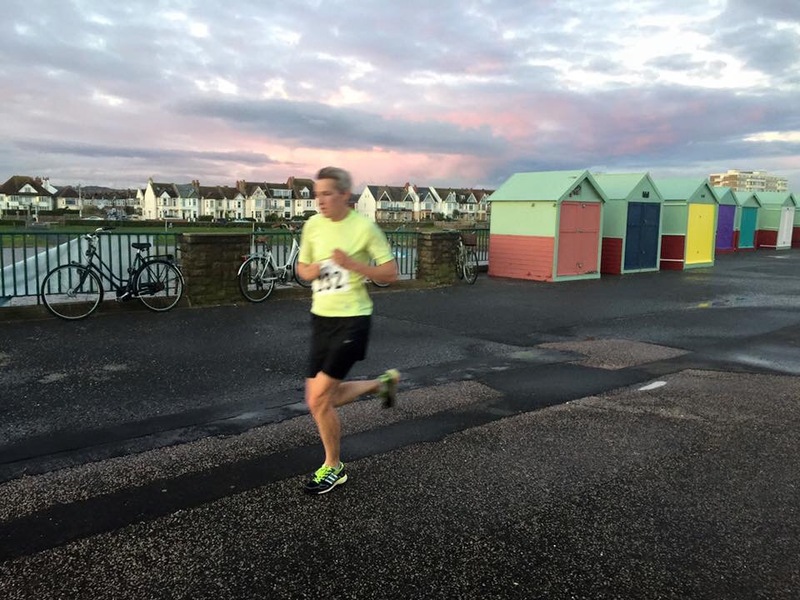 On Tuesday I balanced Monday’s run with 5 miles at an easy pace as I had Tom’s seafront session to look forward to in the evening. 2 x 3 miles. A session I’ve never done before but exactly the sort of thing I feel I should do (also as these sessions start on the seafront near my house I could do them on my own if I fancied). I decided to go out on the first one with Dave as I knew he would pace it much more sensibly than I would. I looked at my watch at halfway and with half a mile to go just so I would have an idea on the second one if I was on for the same time. I passed halfway on the first one in 10.09. I finished in 20.43. After a 4 minute break I set of again with Dave but reached halfway in 10.29 so tried to speed up slightly on the way back so my two reps would be as close as possible in time. 20.53 so near enough. I liked this session as I felt comfortable for both reps and was pleased with the times. Wednesday was time for k reps with Rob in Hove Park. Once again there were dogs, dawdlers and divs (Rob and I) in abundance. Also I was still not fast enough so Rob had to overtake me on the last one which he doesn’t like doing being an utter gentleman so I ruined that one for him and thus also ruined his secret hope of doing under 16 minutes for the 4 reps. He did 16.03. Excellent consistency of 4 minutes +\- 2s per kilometre for him. Mine were a mess: 3.53, 3.57, 4.04, 4.07. In the evening I took the work run clubbers to do Kenyan hills at Duke’s Mound. Easy enough but still hills. I had planned to rest on Thursday as I was at work all day so I did. On Friday I meant to do a run but I badly fell off the sanity wagon so did nothing. On Saturday it was back to Hove Prom after the forced return to Preston Park last week. I was still feeling utterly awful as of Friday. 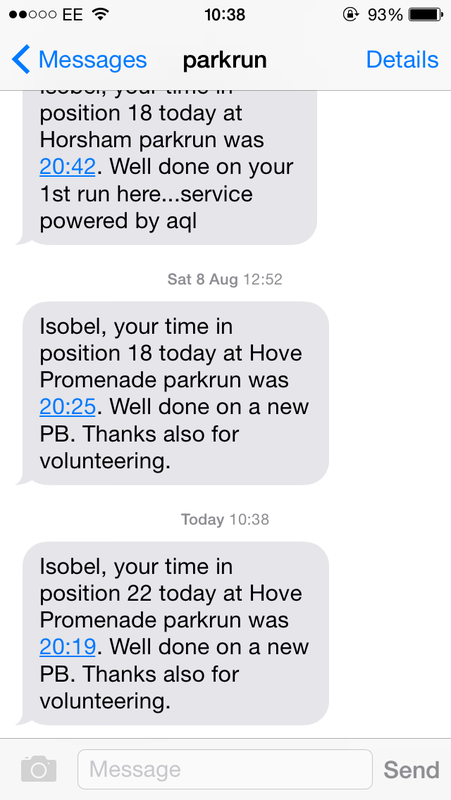 In fact I think I can safely say that I have never wanted to run parkrun less than I did then. It took all my strength just to drag myself out of the house. Horrible. Anyway I managed it. In fact I was surprised with 21.37 as I just wanted to run it consistently and comfortably without putting any strain on my already enfeebled mind. 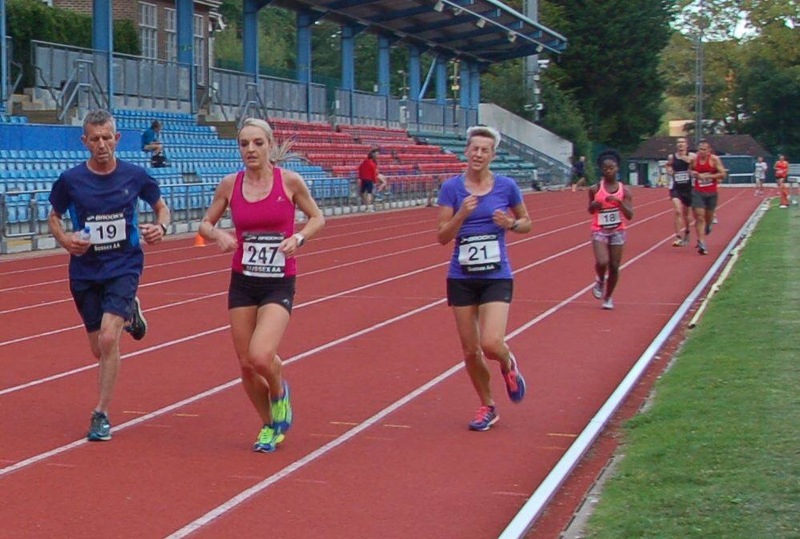 Last week I tried hard for 21.28 at Preston Park. Hopefully this means physically I am over the cold (backed up by heart rate being back to normal at rest after a period of +10 bpm which means you are ill so says science n that). This morning (Sunday) it was time to try a new race. 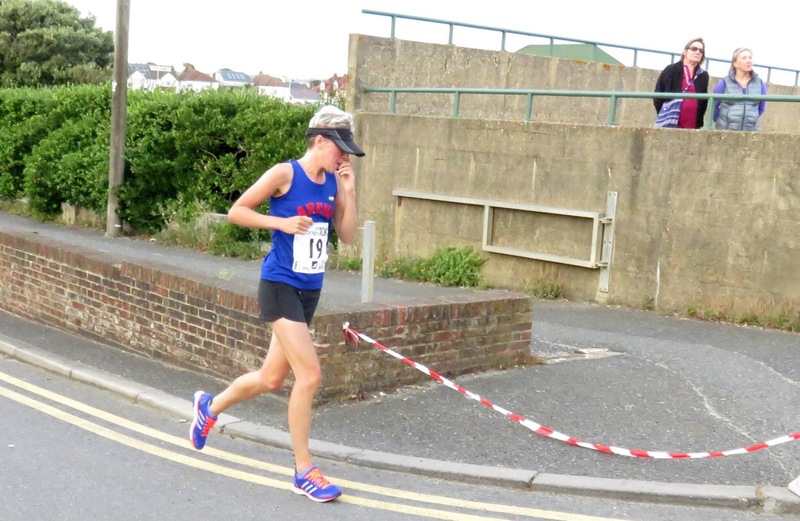 The Littlehampton 10k. The weather was perfect for running. The course was quite nice in the main though there was a horrible grass bit finished off with a section of pebbles. I was pleased with my effort throughout but not when I discovered my time was bilge. Rob measured the course at 6.3 miles (and he didn’t cut any corners whereas I did a few times) but even with the possible extra couple of minutes my time was unacceptable for the effort I put in. Somehow I was second woman. I’m bored of myself and this post now so goodbye until next week. Track. Yawn. I haven’t been enjoying track for a while which means I must have gone insane. Anyway I managed to keep near enough with Rick’s group which is my benchmark of success at the moment. We did 1000m reps followed by three shorter faster reps (x 3). On Tuesday I made up for Monday’s not very good session by doing 6 x Kenyan hills. This time I just went up and down the hill rather than the loop as time was of the essence. I discovered each uphill took 1m 45s and the downs a few seconds faster. It wasn’t stupidly windy like last time either which helped. In the evening I just did 8 x 200m strides with Tom’s group in preparation for his track 5000 on Thursday. Wednesday was going to kick off with some sort of progression run or other threshold type affair but I developed a stupid cold that meant I sneezed and snotted continuously all night. It disappeared as suddenly as it appeared around 7am but I felt it was perhaps a sign I shouldn’t run. So I didn’t. Then nobody turned up for work Run Club in the evening so I was granted an unexpected full day off. Good times. As my LSR partner had returned from holiday we set off on one on Thursday morning. 11 miles but I made it very slow (not on purpose). this should have alerted me that I am tired but it did not. In the evening it was Tom’s track 5000. I was hoping for another 20.30 (though Tom had predicted 20.15). I set my watch once more to count down 20 minutes so it would beep some time on the final lap, hopefully with less than 200 to go. There were a lot of people in my race (the B race for those running over 19 minutes) so I set off relatively slowly aka too fast but still too slow. I wanted to follow Trevor who was pacing Dave to sub 20. I caught up with them after approximately 300m and managed to stay with them for a while but then I began fading and suddenly Trevor was miles ahead and Dave maybe 50 metres or so. I stuck with it though and couldn’t really fault my effort but I just knew I was tired. Even so my watched beeped for 20 minutes just as I rounded the top bend so I was where I guessed I realistically would be. 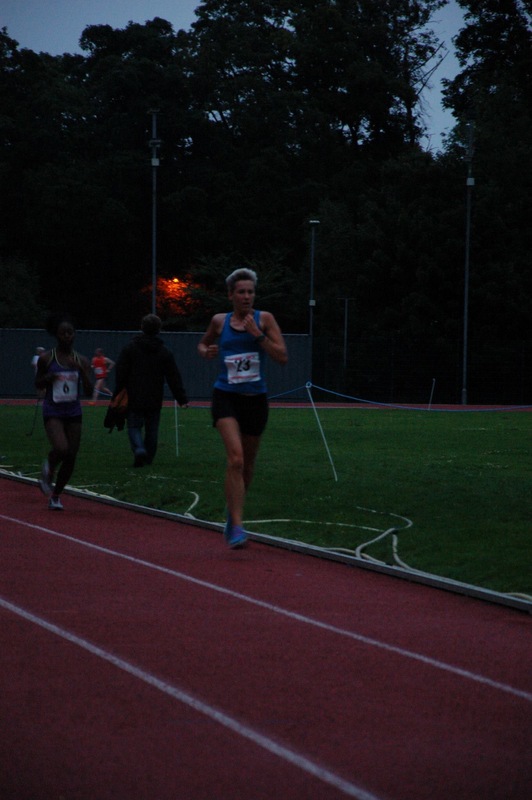 I even threw in an old fashioned sprint finish to cross the line in 20.28. Although it isn’t what I wanted I know I tried throughout and I know I’m not quite in sub 20 form yet as I need the last few weeks’ training to kick in (which requires resting which I’m not so good at) so I have accepted this run as good training. Although I tend to try and fix being knackered by running more I was sensible and didn’t run on Friday. 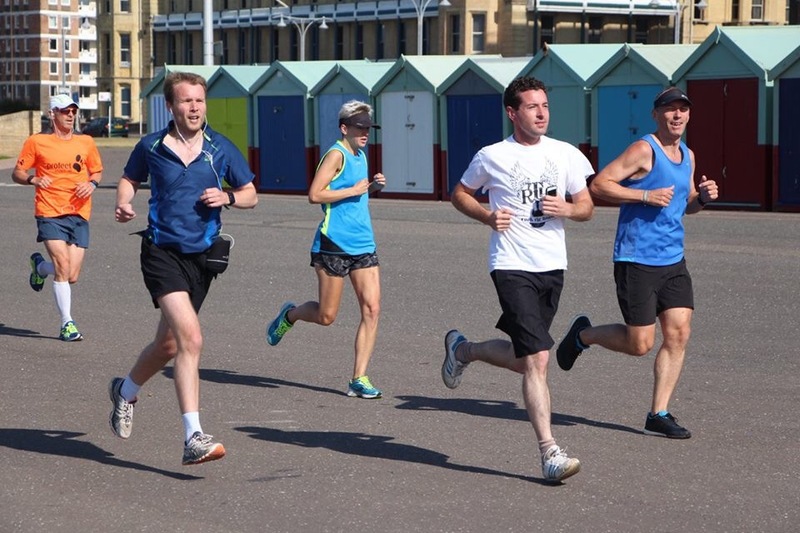 On Saturday I had to make the most of the good weather so off I set to Hove Prom parkrun even though really I knew I wasn’t going to be able to post another good time. I didn’t. 22 dead but it wasn’t through want of trying. It turned out to be surprisingly windy and very hot which didn’t help but mainly I’m just tired. I had arranged with Rob to put him through his paces with some k reps this morning (Sunday). I couldn’t even muster the strength to run to Hove Park so had to cycle. Obviously I knew I wasn’t going to be much use from a running point of view but I started off in the hopes a miracle might occur. It did not. 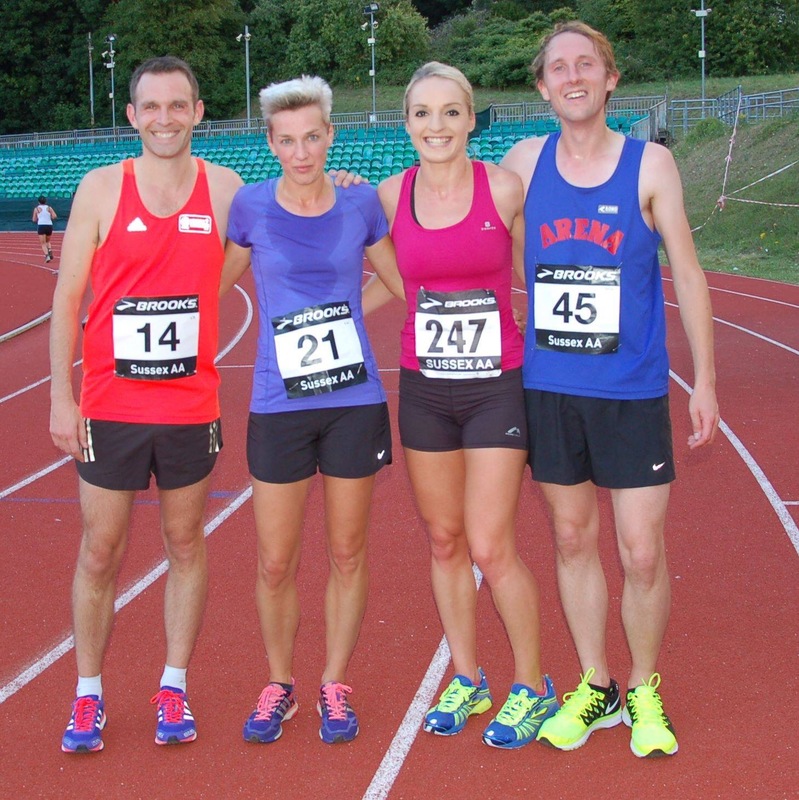 Rob did exactly what he (and I) should have done: 4 x 1k in consistent times of 4 minutes. I managed 3.50, 4.00 and 4.11 before bailing out. I did send Rob out on a solo one which he pulled off admirably. Excellent work by him. I returned home just as it began raining and spent the rest of the day watching the Athletics. Not the best week in terms of running but it’s entirely my own fault for not resting adequately. Track was unsuccessful. 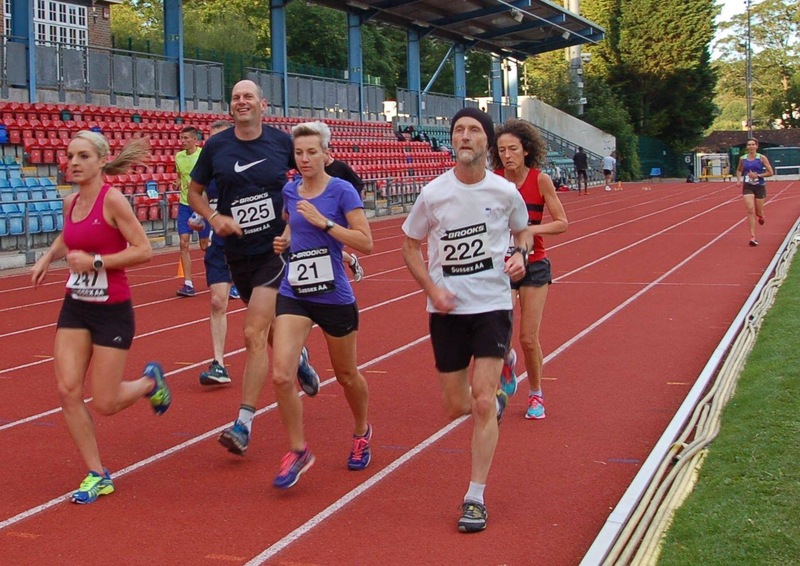 I think I used up my track focus on Thursday for the 10000 as when I came to run on Monday I could only manage going round and round and round at one pace with an incapability to increase speed. Oh well. 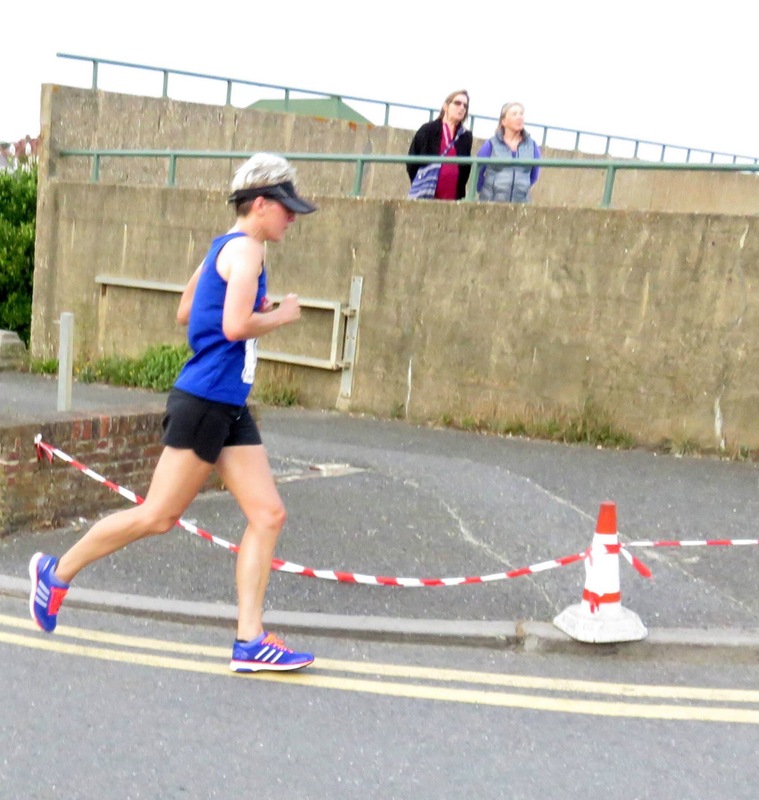 On Tuesday I was let off work early so could have done the annual Adur Challenge after all but as I thought I wouldn’t be able to I didn’t want to stress Bob out by having to decide a handicap for me and fit me in unexpectedly so I decided to go and do Tom’s mile reps session instead. Having not really done much on Monday I hoped I’d be able to improve on my last set of reps which were 6.22s or so. All was going well for the first three; 6.18, 6.16, 6.16 but then on the fourth the cramp that had been threatening throughout Monday’s track session returned so I was forced to slow it down a bit so the fourth rep was 6.29. 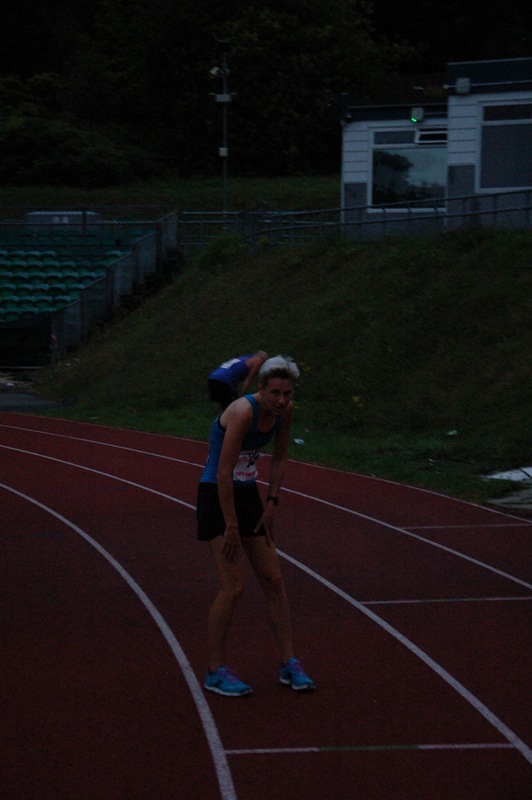 As this was a significant drop I called it a night there though I did join Mark for a cool down final mile in 8.50. Although I was unable to do the full 5 fast I was pleased with the 3 I did manage. I mustn’t forget the track 10000 which must have taken a lot out of me (but you know me, never one to let myself off or have a proper rest). Wednesday meant a long run on tired legs but due to its slower pace there were no almost-cramp incidents. 10 miles in a vari-directional wind aka almost always a headwind. Nice and warm though. 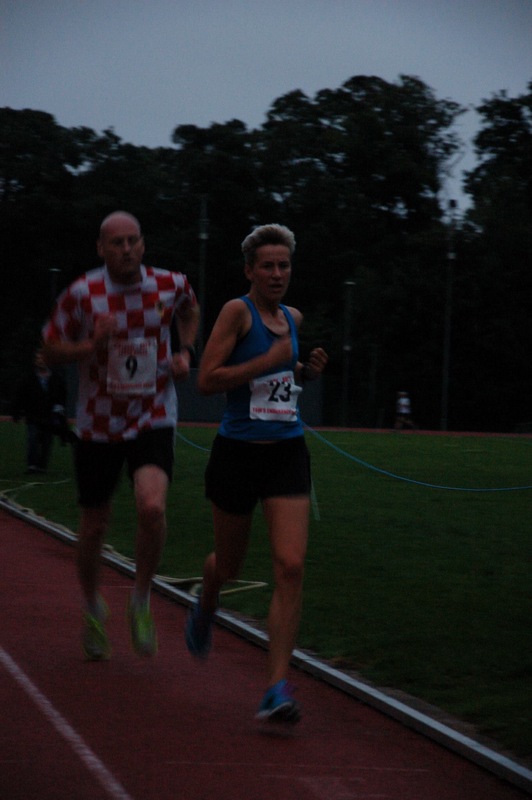 In the evening we were doing sprint which I knew my calf wouldn’t tolerate so I was official timekeeper as the others did 6 x 15 seconds 100% effort. 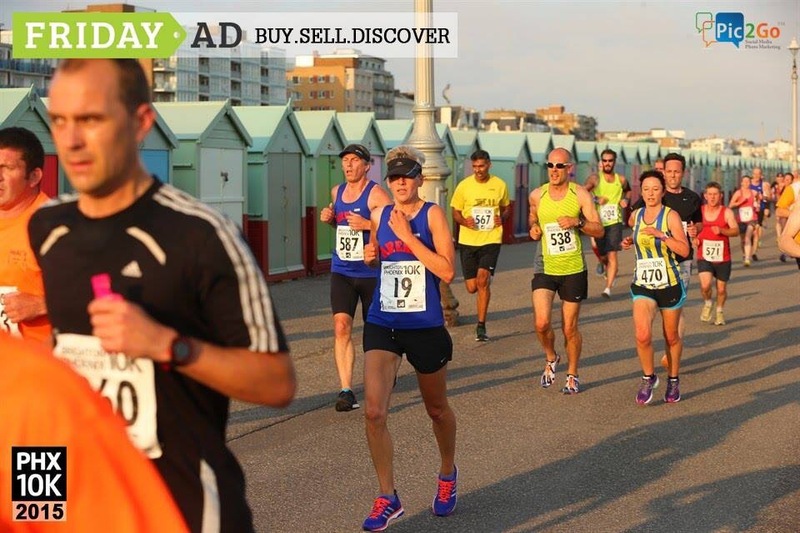 This was sad as I love sprinting but it was good watching the others hoofing it on the seafront when all I had to do was press go on the stopwatch then shout STOP at 15 seconds. I did manage to jog to and from the start though so a very easy recovery jog for me. On Thursday I wanted to do a hill session in the morning but an almighty thunderstorm put paid to that. Too much lightning means headache and general ill feeling so instead I had to go to bed. Huff. Luckily the further storms that were supposed to happen in the afternoon didn’t materialise so I was able to get out to Tom’s session which I knew was 800 reps. The post-storm weather was muggy and humid but not at all windy so we could do straight 800s with a 2 minute rest. I wanted to do the 800s consistently in as close to 3 minutes as possible. 2.58, 2.57, 3.02, 3.02, 3.02, 3.00. Success! 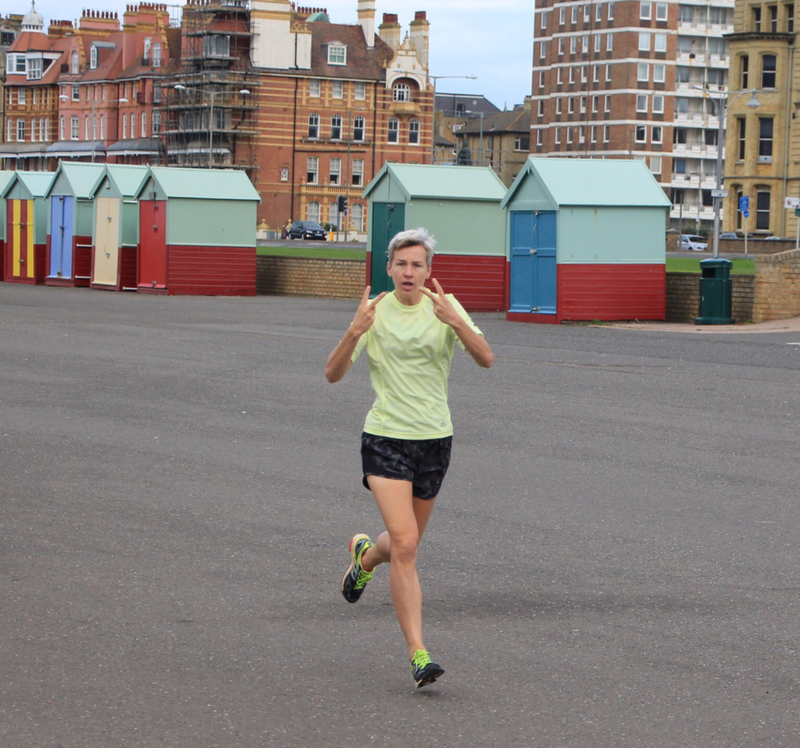 Hove Prom parkrun turned out to be much less windy than forecast but in a direction that meant a constant (though minor) headwind. I had hoped to go out with Tom as I had been ahead of him on the 800s but alas a 5k is an entirely different matter and he was off and away almost immediately. However I stuck to my plan to just keep going. I let myself be put off by a heavy breather and a few other things which wasn’t good but I managed to drag myself out of these temporary blips which is much better than olden times. I passed halfway in 10 minutes. I felt I wasn’t doing as well as last week so was pleased and surprised when my watch beeped in roughly the same place as last week signalling 20 minutes was up. A mere 19 seconds later I crossed the line. A 6 second improvement on last week but the same 20 second or so loss in the last 2.5k. Must work on staying strong in the second half. This morning (Sunday) I went out for a steady 5 miles to try and teach myself to endure the uncomfortableness of running. It was rather hot so I rained sweat off my own elbows onto my legs. Good as that is usually Rob’s job but he is still on holiday. Another good week of training and progress. Monday’s track session was another combination of fast bits and slow bits. This week it was (5 x) 300f, 100j, 300f, 100j, 300f but the middle rep increased by 100m each time. I didn’t push it too much as I had plans for many hard runs over the coming days and Rob was going on holiday for two weeks so I felt I should fully utilise my final opportunity to annoy him. It was still a good session though and I wasn’t wholly idle. On Tuesday I went out and did a hill session which is something I haven’t done for ages. I had already decided to try a hill slightly closer to me than King George. It turned out not to be that much closer but was less steep and not as long but made a good loop for Kenyan hills which was to be my session for the morning. The hill is around 300 metres long and a 10% gradient. The full loop is roughly 800 metres (300 up, 100 along, 300 down, 100 back to the beginning). As the hill was a mile or so of hills away from home I thought six loops would be fine. I soon discovered that is was incredibly windy on the downward stretch so I had to work on these sections too. all in all this was a hard session but all the better for that as I haven’t really pushed myself for ages. In the evening I cycled over to Hove Park for Tom’s session which was to be 5 x 1k. He had us running a loop I haven’t done before but I was good as it kept it mainly flat which is always a bonus in my book. I wanted my ks to be as close to 4 minutes, consistently, as I could manage. I was rather surprised when I completed the first in 3.46. Eeek! Had I peaked too soon? No. 3.48, 3.47, 3.50, 3.50. Excellent. I was very pleased with this session. On Wednesday morning I set out alone on an LSR. I decided to do it a little bit faster as I hate running LSRs on my own so at least this would mean it was over with more quickly. As I don’t have a watch anymore I don’t know what pace it was but it felt faster than normal which was the aim. Not fast. As that would be a LFR. 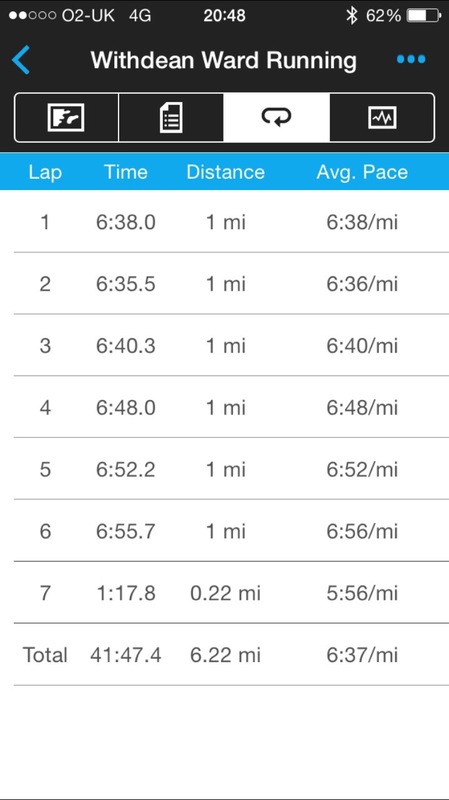 In the evening it was Run Club so I ended up doing reps of various distances at perceived efforts of 60 – 100%. This was hard work but I really enjoyed it. On Thursday it was time for Tom’s annual track 10000. 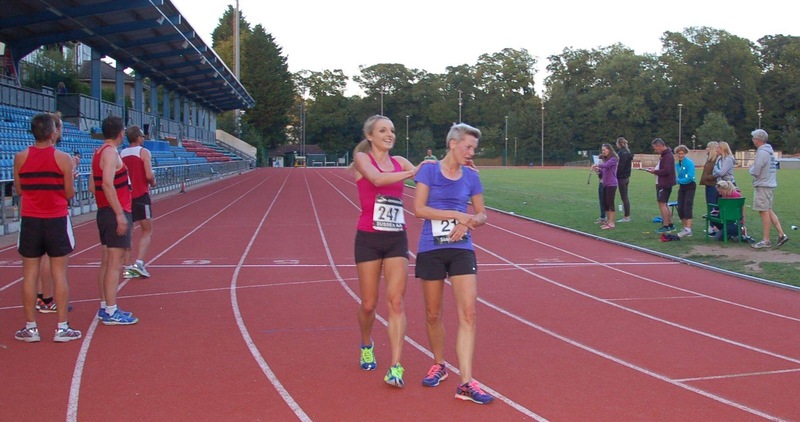 Emily kindly said she would pace me for 41.30. I like having someone to MAKE me try as I’m often not good at doing it myself. I don’t even remember this photo being taken. Why am I so sweaty? Emily did an excellent job spurring me on all the way round and I can safely say I feel I tried as hard as I could the whole way round … and round and round and round. And round. I was slightly disappointed that my time was only 41.48 after putting in so much effort but I must remember I haven’t done anything proper for ages whilst being and ironless weakling and one cannot put in more than 100% effort so I must be pleased. It has inspired me to bloody well get on with and get back to 2013 speeds. Although actually I reached those again for 5k earlier this year before my stupid idea to stop taking the iron. 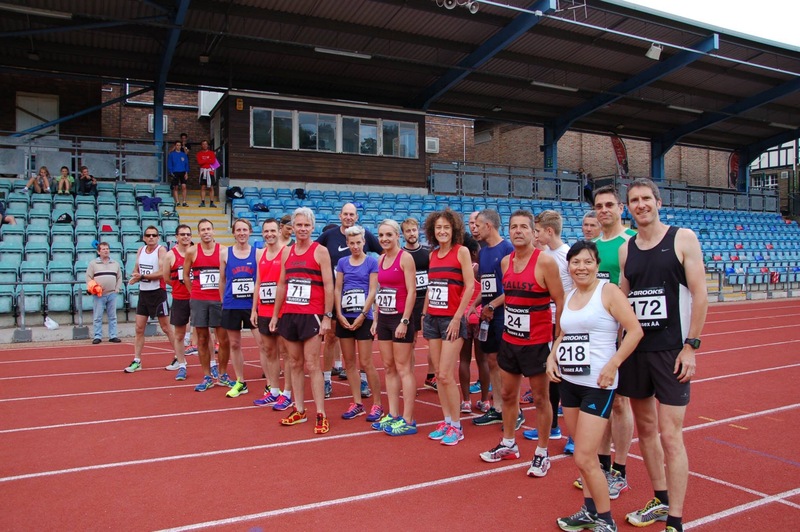 Massive thanks to Tom for organising this and getting it officiated so it now appears on Power of 10. Thanks also to Camilla for her lap counting and encouragement. On Friday I went for a 3 mile run of indeterminate speed (fasting in parts) as I felt guilty at my slacking. I’ve been reading too many runners’ autobiographies. 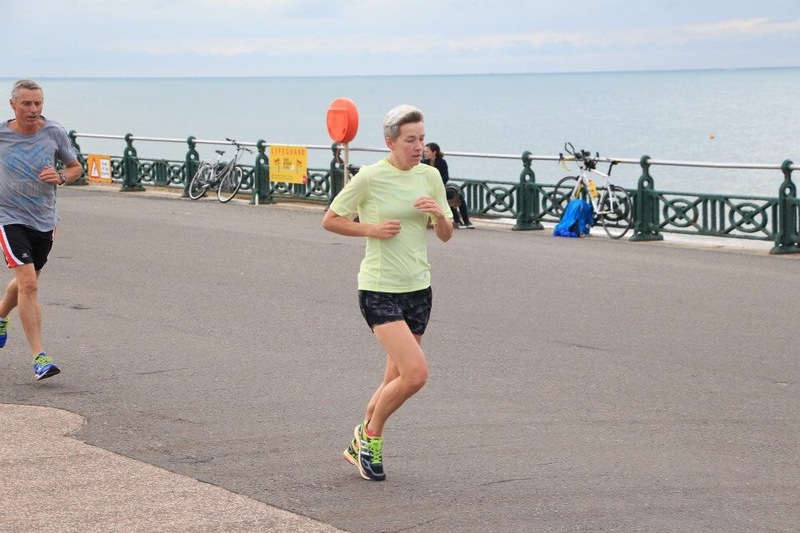 Hove Prom parkrun was back on this week so I cycled down. It was probably the least windy it will ever be there. Only a slight wind coming from the south east. 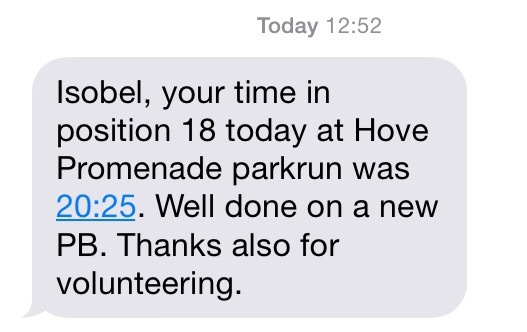 This meant I had no excuses for a crap time (like my previous three). I had told Emily I would find anything under 20.30 acceptable. I had a new plan: set watch to count down from 20 minutes and see how far I was from the finish when it beeped. I set off at what I felt was a sustainable pace. It was no doubt too fast but I don’t feel I dropped too much. I passed 2.5k (I don’t know where the k points are) in 10.05 so as long as I didn’t slow down too much I was going to be at least sub 21 which I haven’t managed here yet. 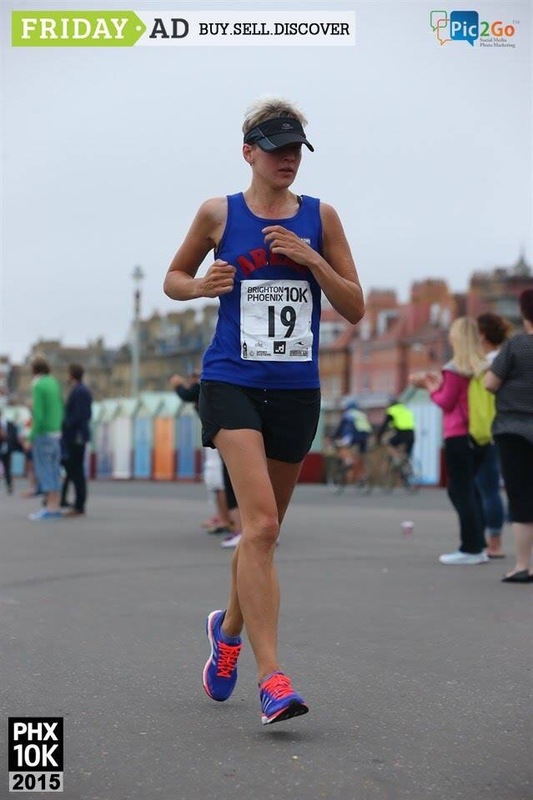 The fear of my watch beeping whilst I was still miles away from the finish helped spur me on, along with imagining Emily shouting at me that it was all in my head and I had more in the tank. The beeping started in the home straight but the line was in sight (thanks hi vis signage and marshals) and I made it over in 20.25. So only a 15s drop in the second half. Excellent. Two excellents in one post? Good grief! I rounded off a 47 mile week with 3 x 8 minutes at 80% perceived effort. It was very hot. Nothing now until track tomorrow evening.